Life support refers to a spectrum of techniques used to maintain life after the failure of one or more vital organs. Establish and maintain the ABC's of resuscitation—airway, breathing, and circulation. Restore the patient's homeostasis—the internal chemical and physical balance of the body. Protect the patient from complications of the underlying disease and its treatment. Patients and families need to recognize that life support is an extremely painful, expensive, and emotionally wrenching experience. Life support exposes a patient to vast risks of further medical complications, and offers no guarantee of a positive outcome. Even in successful cases, recovery may be slow and frustrating. Successful life support begins with establishing the ABC's of resuscitation—airway, breathing, and circulation. Life support may begin with basic cardiopulmonary resuscitation (CPR), as in cases of cardiac arrest. Thereafter, the most common technique used to create a secure airway is insertion of an endotracheal (ET) tube through the mouth or nose into the windpipe (trachea). An alternative method of securing an airway is by tracheotomy, a surgical procedure in which a tube is inserted into the trachea through an incision made in the base of the throat. Of the two options, placement of an ET tube is usually quicker and more convenient, and thus occurs much more commonly. Doctors perform a tracheotomy when they cannot establish an ET airway, or when the patient will require an artificial airway for more than a week or two. When the patient cannot breathe sufficiently, the physician will use a ventilator, a machine that pumps air in and out of the patient's lungs. For many doctors and members of the public, the term "life support" calls up the image of an ET tube and ventilator. In order to ensure adequate circulation, the patient will require one or more intravenous (IV) tubes (catheters). The IVs may include both the short needle and tube commonly used in the hand or forearm, and longer catheters inserted into the larger and more central veins of the body. Catheters inserted into these larger veins are known as central lines. Through the IVs the patient receives fluids, drugs, and blood transfusions as needed to support the circulation. Once the ABC's are secure, life support is directed at maintaining homeostasis, the body's delicate chemical and physical balance. In a healthy person, the body keeps precise control over many components of its makeup, such as its fluids, nutrients, and pressures. When vital organs fail, the body can no longer regulate these components, and the doctor must take steps to restore the normal state. The need for life support may arise suddenly and with little warning. All people should discuss in advance with family and doctor their wishes for the use of life support should a medical crisis develop. The doctor will note the preferences in the patient's record. Patients should sign documents such as an Advance Directive and Durable Power of Attorney for Health Care to express their wishes and designate a surrogate decision-maker in case of incapacitation. If a patient survives life support treatments, doctors will cautiously try to wean the patient from the support systems. Being able to breathe adequately without the ventilator is one major hurdle. Patients commonly fail in their first attempts to breathe on their own, often tiring out after a few hours. Thus, the doctor will reconnect the ventilator, give the patient a rest, and try again in a day or two. As the patient regains organ function, there is less need for monitors, tests, and treatments that require an intensive care setting. The doctor may transfer the patient to a lower level of hospital care, a skilled nursing facility (SNF), or perhaps directly to home. Physical and occupational therapists may help the patient improve strength and endurance. The patient will receive continuing care from the primary doctor and specialists as needed. The patient may require prescription drugs, assist devices, and psychological therapists. The financial costs of life support are huge. A single day of life support costs many thousands of dollars. These expenses fall on individual payers, insurance companies, health plans, and governments. All such payers face difficult decisions regarding the allotment of money for such treatment, especially in cases that are likely to be futile. Society as a whole faces difficult decisions surrounding life support. Some governments have enacted regulations that establish priorities for the spending of health care resources. Patients who do not receive treatment under such rules may feel victimized by society's choices. Cardiopulmonary — Relating to the heart and lungs. Central line — A tube placed by needle into a large, central vein of the body. Defibrillation — Use of an electric shock to restore a normal heartbeat. Endotracheal tube — A tube placed into the wind-pipe through the nose or mouth. Foley catheter — A tube that drains urine from the bladder. Homeostasis — The internal chemical and physical balance of the body. Nasogastric tube — A tube placed through the nose into the stomach. Neuromuscular — Relating to nerves and muscles. 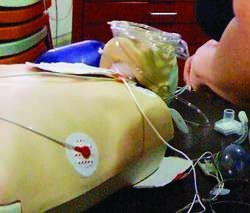 Resuscitation — Treatments to restore an adequate airway, breathing, and circulation. Sepsis — An overwhelming infection with effects throughout the body. Tracheotomy — A surgical procedure in which a tube is inserted into the trachea through an incision made in the base of the throat. Trauma — Serious physical injury. Ventilator — A machine that pumps air in and out of the lungs. Vital signs — Basic indicators of body function, usually meaning heartbeats per minute, breaths per minute, blood pressure, body temperature, and weight. Irwin, Richard S., Frank B. Cerra, and James M. Rippe, editors. Irwin and Rippe's Intensive Care Medicine. Philadelphia: Lippincott-Raven, 1999. Luce, John M., "Approach to the Patient In a Critical Care Setting." In Textbook of Medicine, edited by Lee Goldman and J. Claude Bennett, 21st ed. Vol. 1. Philadelphia: W.B. Saunders Company, 2000, pp. 483-4. Tintinalli, Judith E., et al, editors. Emergency Medicine: a comprehensive study guide. New York: McGraw-Hill, 2000. A life-support system: a patient on life support. the use of any therapeutic technique, device, or technology to maintain physical life functions. Elliott Naishtat, D-Austin, would remove that requirement and allow pregnant women to be taken off life support. Advanced life support involves use of interventions such as endotracheal intubation, intravenous fluid and drug delivery, and semiautomatic defibrillation. a spouse) could therefore request a hospital to maintain the corpse with life support until the child is born. Reportedly the Astral 150 life support ventilator recently earned a prestigious Red Dot Product Design Award for 2014. Dr Roberts and Welsh Hearts will be visiting schools and spend about an hour running the session in the hope that by teaching it in this manner it will provide a more thorough understanding of basic life support and may even stimulate an interest in medicine among the students. The medical providers also re-certified their credentials in Advanced Cardiac Life Support by completing an intensive interactive online course and managing a hands-on practicum of a cardiac arrest. The certification provider offers an advanced cardiac life support (ACLS) training program online, as well as an ACLS recertification program online. But his family are in dispute over the decision to turn off his life support. Out of the total number ( n=110) of doctors, 94 (85%) said they would use Life Support in their patients and 41 (43%) of them thought life support was the only way the doctor can "do what he is supposed to do i. This notion of me ending up on a life support machine powered either by a wind turbine, or Wylfa B, is out of the question. The Kingsley School in Beauchamp Avenue has teamed up with the Basic Life Support society at Warwick University to arrange for medical students to visit the school. Among these areas are First Aid, Basic Life Support (BLS), Advanced Cardiac Life Support (ACLS), Advanced Trauma Life Support (ATLS), the Pediatric Advanced Life Support for children (PALS), Focused Abdominal Sonogram for Trauma (FAST), Advanced Life Support in Obstetrics (ALSO), Major Incident Medical Management and Support (MIMMS), Advanced Disaster Administration and Management Support (ADAM) and others.